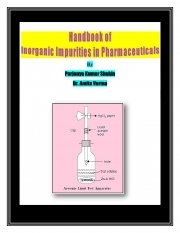 Description of "Handbook of Inorganic Impurities in Pharmaceuticals (eBook)"
This book is about the sources of impurities in pharmaceutical products and their limit test according to the Indian Pharmacopoeia 2007. Point wise and tabular presentation of the topic is the main features of this small book. Hope this book will help B. Pharm & D. Pharm students as well as chemistry students to understand Inorganic Impurities and their limit test procedures in easy way. Parjanya Kumar Shukla is B. Pharm, M. Pharm (Pharmaceutical Chemistry) & Ph D Pursuing in Pharmaceutical Sciences. He is Presently working as Assistant Professor in department of Pharmaceutical Chemistry, Krishnarpit Institute of Pharmacy, Allahabad, India. Reviews of "Handbook of Inorganic Impurities in Pharmaceuticals (eBook)"